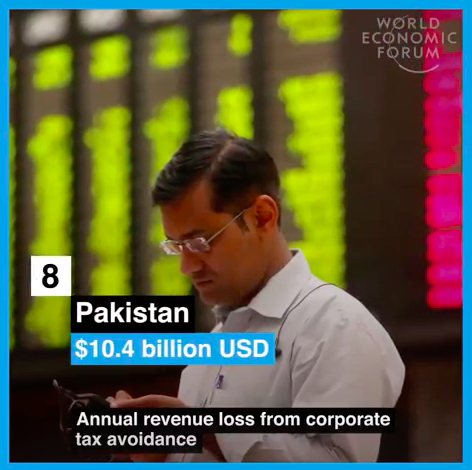 Pakistan ranks among the top 10 countries in terms of tax revenue losses due to corporate tax avoidance, according to UN World Institute for Development Economics. World Economic Forum estimates that the country lost $10.4 billion in taxes last year. The top 10 countries losing the most tax revenue in absolute terms as listed by the World Economic Forum are USA ($188.8 billion), China ($66.8 billion), Japan ($46.1 billion), India ($41.2 billion), Argentina ($21.4 billion), France ($19.8 billion), Germany ($15 billion), Pakistan ($10.4 billion), Indonesia ($6.5 billion) and the Philippines ($6.4 billion). 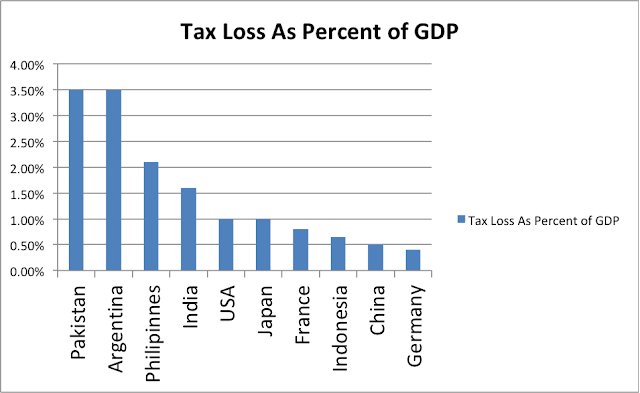 Pakistan and Argentina top this list of 10 in terms of tax revenue lost as percentage of GDP. Both lose 3.5% of their GDP in corporate tax avoidance, according to World Economic Forum. Tax evasion in Pakistan starts at the top. A large number politicians, including ministers and party leaders in the nation's parliament, do not bother to file tax returns or pay taxes. A study by the Center for Investigative Reporting in Pakistan (CIRP) identified 461 members in national and provincial assemblies who did not pay income taxes in 2015. This figure includes ministers and other prominent political leaders. Federal Board of Revenue found that many of the 550 lawmakers (54%) falsely claimed they paid taxes. Whatever little accountability that exists is now being eroded by Elections Act 2017. Tax evasion in Pakistan exacerbates budget deficits and forces the government to borrow heavily. It also impacts critical spending on education, health and infrastructure. The result is slow economic growth and persistence of poor socioeconomic indicators. Pakistan's tax revenue loss of $10.4 billion is ranked among the world's top 10 countries losing tax revenue. Losses of 3.5% of GDP in taxes put Pakistan at number 1 among these countries. Legislators, including government ministers, are among the most prominent tax evaders in the country. Elections Act 2017 limiting financial transparency makes it more difficult to hold the politicians accountable for tax evasion and other financial malfeasance. These developments don't augur well for development or democracy in the country. 30% Sales tax on electronics (Washing Machine, Laptop, Computers, Toasters, Oven, TV)"
What you refer to are indirect taxes which unfairly burden the poor. It's a regressive tax system that favors the rich. Very few individuals and corporations pay direct taxes like the income or property taxes.